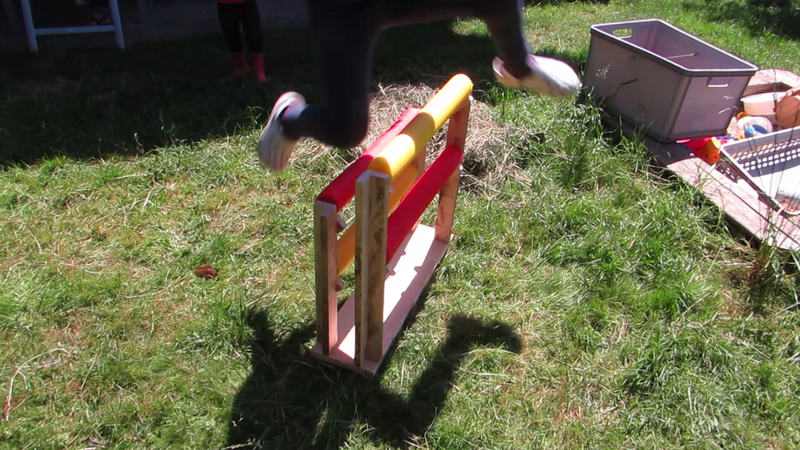 In this new Adventure in the Workshop, my daughters and I made a garden obstacle for them to play horse, featuring variable heights, scrap use and a lot of “horsing around”. Please share this if you found it useful, find more information below the video, and remember to be Inspired! I think the circle cutter is a nice tool to introduce kids to the different ways of cutting holes. At the very least it adds a little novelty to the build, otherwise using tools that are pretty common. If you do not have a circle cutter, though, or do not feel comfortable using them around kids, you can have them cut out the holder pieces on the scroll saw as well. In fact, these pieces do not even need to be round at all. You can get away with a v-shape made from short lengths of slat. I used a lot of scrap pieces (which I think is most obvious in the way the corner pieces look). The L-shape gives them stability, but you could get the same result using small beams. You could also glue or screw two scraps together to make that L if you want your garden obstacle to be a little more stable. One thing I did not take into account was how the baseboard would react to living outside, exposed to the elements. It started to cup in such a way that both sets of obstacles started to come together and the whole thing would rock slightly. I could have screwed another board to this one to keep is straight, but I chose to take advantage of the dowel connections and bend the holders out slightly. This way the obstacles are at a distance again and the whole thing can still be used. Those dowel connection, meant to allow the thing to come apart if a kid hits it the wrong way, do not work very well in practice either. Most likely due to moisture making the dowels swell, in addition to the hole being a really tight fit in the first place. But as it turns out, the kids hardly ever hit the wooden pieces at all, so at least in my experience, this feature is unnecessary. Check out the other Adventures in the Workshop for more ideas on what you can make with your kids while teaching them the basics of tool use and making. If you are looking for inspiration in general, you can find it here. And if you like what you see, subscribe to my mailing list so you never miss a new release! And as always, remember to be Inspired!